Lookin' good, Harley! Fan-favorite Harley Quinn, star of Suicide Squad and Joker's main squeeze, joins the MAF EX lineup from Medicom! 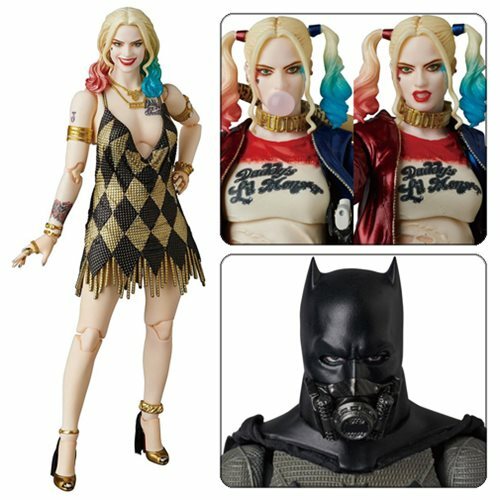 Standing just over 6-inches tall, the Harley Quinn Dress Version MAF EX Action Figure features Harley in her glittering gold cocktail dress. She is generously articulated and comes with extra parts for the standard Harley Quinn MAF EX Action Figure and the Batman MAF EX Action Figure. This Suicide Squad Harley Quinn Dress Version MAF EX Figure measures about 6 1/3-inches tall and comes with a display stand. Ages 15 and up.